The Study sets a baseline for life and space in the Civic Center district. This baseline allows the City to identify challenges and opportunities to amplify public life in Civic Center. It also allows the City to measure progress towards target public life outcomes during interim activation events and future phases of physical improvements. A strategic framework for amplifying public life in Civic Center also accompanies this document. Public Life in Civic Center isn’t living up to its potential. The District’s grand architecture and ceremonial public spaces were designed to inspire awe and serve as ceremonial gathering spaces, not meet the needs of people who live or work nearby. Over decades, the few human-scale elements have been removed. There is too much empty public space in Civic Center, and too few invitations to be there. Today, many of the people spending time in Civic Center’s public spaces have nowhere else to go. The effects of larger social issues like homelessness and drug use have become synonymous with the space. We can’t wait for these complex issues to be solved before we do something to improve public life. Design alone cannot solve the challenges in Civic Center - but it can help. Civic Center’s public spaces deserve unique, compelling invitations that give more people a reason to be there. Programming, food, appealing landscape elements, and recreation facilities encourage people to come, and make people passing through feel welcome to stay. Progress is only possible through a coordinated effort towards a common vision. Design, programming, social services, stewardship, and communications must work together for the kind of life we want to see in Civic Center. It starts with a Framework for Public Life. Is Civic Center living up to its name? Civic Center \ ‘si-vik \ Adjective 1. Relating to a city or town, especially its administration; municipal. 2. Relating to the duties or activities of people in relation to their town, city, or local area. Origin: Mid 16th century: from French civique or Latin civicus, from civis ‘citizen’. The original use was in civic garland, crown, etc., translating Latin corona civica, denoting a garland of oak leaves and acorns given in ancient Rome to a person who saved a fellow citizen’s life. Civic Center /’sen-ter/ Noun 1. The point that is equally distant from every point on the circumference of a circle or sphere. 2. The point from which an activity or process is directed, or on which it is focused. 3. A place or group of buildings where a specified activity is concentrated. Origin: Late Middle English: from Old French, or from Latin centrum, from Greek kentron ‘sharp point, stationary point of a pair of compasses’, related to kentein ‘to prick’. Civic Center is ready for a change The Civic Center district’s public realm is overdue for an update. Adjacent neighborhoods like the Tenderloin lack public space. The existing neighborhood’s need for high quality public space will only grow as people continue to move to the district, and as the area continues to grow as an arts and culture hub. The City has identified the transit-rich Hub district near Civic Center as a strategic area for more people to live in San Francisco. The most recent plan for the Civic Center’s public realm is nearly 20 years old. Public Works-led “Civic Center Historic District Improvement Project” by SMWM and Olin Partnership. Since the 1990s, the area has grown as both an arts and culture district and a residential neighborhood. We come here for the opera - but we rush through Civic Center. This is my neighborhood open space - Why are there so few public benches? A city observes itself Nearly 100 volunteers collected the data that makes up this report. Numerous city agencies, budding urbanists, interested citizens, the Department of Public Health, Another Planet Entertainment, volunteers from the Opera, Stanford, Berkeley, and other educational institutions all participated. It was a citywide affair! 4 Snapshot Days + 2 spot-counts There is no typical day at Civic Center. We selected four days that represented different common activity profiles and supplemented these counts with two spot-counts to capture specific conditions. The survey ran from 8:00am to 8:00pm on each day unless noted. From daily weddings and civic business to weekly farmer’s markets to annual regional gatherings like Pride and protests, Civic Center has many facets of its public life, impacted by events with varying character, size, and frequency. The Public Life Study focused on events that happen in the daily and weekly rhythm. The Civic Center Commons initiative activates Civic Center’s public realm with free music, art, and activities. This study did not occur during a planned event. “The Commons” is used throughout this document to refer to the three public spaces that make up Civic Center’s grand axis. The Public Space and Public Life survey looked at the entire Civic Center District, which borders neighboring Hayes Valley, SoMa, Mid-market, Tenderloin, and Little Saigon neighborhoods. Findings and recommendations focus on five areas and the streets that connect them. locations were selected to capture the 1C ebb and flow of the public life of Civic Center, focused around its central public spaces. Count pedestrians moving across the indicated line, noting age and gender for 100 people or 10 minutes, whichever comes first. If there are obstructions, adjust the location of your line as necessary to maintain a clear sightline from end to end. 2 3 4 5 6 7 8 9 10 11 12 13 14 15 16 17 18 19 20 21 22 23 24 25 26 27 28 29 30 TOTALS: Walk through the area indicated in red above to capture a PROCEDURE: snapshot of the stationary activities and age / gender of the people present in the public space. Sleeping can be positive, but it can also be a manifestation of larger societal issues. Working with SF Planning, Gehl created activity categories to capture less socially acceptable and illicit behaviors that are part of the areaâ&#x20AC;&#x2122;s public life profile. These activities were measured as a way of creating a common understanding of where, when, and how often these activities take place in the space. Activity categories were standardized for ease of comparison, but do not capture all nuanced behavior observed in the spaces. Survey Methods Intercept Survey Asking questions about sentiment, habits of use, demographics, and other elements not captured with observation. The Intercept Survey was taken by 419 people, from a total of 966 people who were approached. Striking architecture makes Civic Center a successful San Francisco Icon Civic Center, like the Ferry Building, Twin Peaks, Lombard Street, Golden Gate Bridge, and other destinations, are central associations with the image of San Francisco. Civic Center is among the great squares and civic spaces of the world, including: the Campo de Sienna in Italy, Trafalger Square in London, Rittenhouse Square in Philadelphia, Place de la République and Place des Voges in Paris, Copenhagen’s City Hall Plaza, Bryant Park in New York, and the Zócalo in Mexico City. Our Civic Center’s iconic buildings deserve an iconic public realm. With a public life profile centered around the seasons of life Civic Center hosts all rhythms of civic, public, and private life: weddings, war memorial, world-class arts, daily civic and neighborhood business, moments of civic togetherness and civic unrest. People move to San Francisco to celebrate the dignity and diversity of human life. It is the place where the passions of our city are manifested in public space. Sports Field / Active Rec. Ephemeral events and programming add life intermittently, but are the everyday activities of a neighborhood district supported by permanent amenities? Civic Center has most of the amenities of a complete neighborhood - but they are clustered on the periphery. Many of the opening hours of these amenities cater strictly to office workers, not neighborhood patrons or visitors. Large Institutions at the core of Civic Center. The pedestrian experience in Civic Center is defined by long, inactive façades with few openings and very little transparency. Vibrant and active façades are only experienced at the periphery. The strong visual axis from Market Street to City Hall is disconnected by high-traffic streets and a dull public realm. Disconnected public realm is mirrored in jurisdictional boundaries Many jurisdictional boundaries overlap in Civic Centerâ&#x20AC;&#x2122;s iconic public spaces. Split by two police districts, two business improvement districts, and other management and programming entities, the only entity that encompasses all of The Commons is the Downtown Streets Team. Civic Center We analyzed the Civic Center district as a whole according to the 12 Urban Quality Criteria. Qualities of seeing and looking are strong in Civic Center, as is aesthetic beauty. But it is falling short on fundamental qualities that make a space inviting for people. Protection Without basic protection from cars, noise, rain, and wind, people will avoid spending time in a space. Protection from these things is mandatory for a place to be used. Comfort Without elements that make walking, standing, sitting, seeing, and conversing comfortable, a place does not invite people to spend time there. Brr Iâ&#x20AC;&#x2122;m happy to be in the sun! I just got married..but where do I go now? Enjoyment A great place distinguishes itself from a good place by including elements that invite people to be active and make use of the positive aspects of microclimate and human scale. Little to delight the 5 senses Successful public spaces appeal to all the senses - not only the delight of beautiful architecture, but also touch, smell, and taste. At the time of this survey, there were few positive invitations to delight the senses in Civic Centerâ&#x20AC;&#x2122;s 730,000 square feet of public open space. The Civic Center Commons Initiative is making things better. Movable tables and chairs, a permanent kiosk, and two new world-class playgrounds are a step in the right direction, but there is still much to do. Humans feel more safe when we can recognize other people and their emotions. The following scale comparisons demonstrate public space designs that function both as a civic gathering place as well as a place that honors the human scale. This space struggled with issues like drug use that currently challenge Civic Center. Through design, programming, and a robust financing model, Bryant Park is now a beloved place. It succeeds in hosting a wide variety of activities, from movie nights to a cafe to a lending library to games, by subdividing the exterior of the park into humanscale rooms, framing a central lawn. The Beaux-Arts plan is focused around grand architecture, large public spaces, and clustering institutional uses. This squeezes out the life of the city by limiting active building edges, everyday retail and commerce, and informal cultural uses. Over time, even human-scale elements of this design such as planting, seating, water features and monuments have been removed, creating a public realm that only invites people to pass through, except during large, infrequent events. Special-event activation Dozens of permits are distributed each year that include large special events that program the entire space like SF Pride, and small events that activate Civic Center Plaza three times a week during a season like America Scores Soccer and food trucks. 4,000 people per hour at evening rush hour! The Heart of the City Farmers Market in UN Plaza is one of the largest in the city. The existing public life makes for some of the best peoplewatching in San Francisco. A normal weekday is busier than a ‘busy’ weekend This pattern of public life tells us that people don’t choose to come here in their free time. In a connected public realm network we might expect to see all public spaces in the District following a similar pattern of activity. In Civic Center, events do not tend to spill over into adjacent spaces. If there were spillover effects, Fulton Street, Memorial Court and Civic Center Plaza would see a corresponding increase in public life. Spaces with seating, shade, active ground floors and entrances, interesting buildings, and other humanscaled elements invite more people to spend time, such as near Asian Art Museum entrance. Even during big, regular events like the Farmers Market, activity in one space does not flow to adjacent spaces. Pedestrian movement tracing Date: 05-26-2017 Time: Morning commute - 6:00am - 10:00am Observed via timelapse camera mounted on City Hall dome with narrow view. A City Hall wedding is an SF tradition! City Hall steps are doing double-duty. Not many photo-ops in Civic Center Plaza! When there are few places to sit, people can only stand, or they do not come at all. Healthy pubic spaces allow approximately 50% of all people spending time to sit. If there were more generous invitations to spend time, would more people spend time in Civic Center? An ode to improvised seating Improvised seating is part of the delight of city life - finding your own space within a space is part of a human-scaled city. However, when informal seating is the only available seating option many people - especially older people - will not choose to come to this space. Civic Center has a lot of improvised sitting - how can we make more formal invitations to spend time? If just passing through, are you headed anywhere in particular? Few people choose to stay Civic Center has relatively few people moving through the space compared to similar sites. Compounding this emptiness, only a small fraction of those moving through decided to stop and stay. “Stickiness” is a measure of how many people are spending time in a space, compared to who is moving through. A “sticky” space that encourages people to spend time often has a healthy public life profile. Civic Center holds the potential to be the vibrant heart of San Francisco it was envisioned to be. In order to support WEEKEND BUSY DAYWEEKEND - SAT. 5/27/2017 DAY - SAT. 5/27/2017 1:26 the type of public life found in other vibrant spaces, the area will need many more invitations for people to stay. Each space has a unique public life heartbeat. Method for analysis: To analyze the profile of people spending time in each major space within the Civic Center District, we averaged public life volumes each hour from 8am to 8pm over four survey days, and then normalized them by square foot to arrive at activities per square foot for each hour of the survey. Van Ness between McAllister and Grove is a major transportation corridor, 10a 11a and 12pmost1ppublic 2plife happening 3p 4p here 5p 6p throughout the day is people waiting City Hall Average Hourly Activities Per 10,000 Square Feet, Stacked for transit. The sidewalk in front of the Opera and Herbst Theater is periodically bustling with concert and special-event goers, but they 10a 11a 12p 1p 2p 3p 4p 5p 6p donâ&#x20AC;&#x2122;t host much activity when the are Memorial vic Center Plaza Average stages Hourly Activities Per dark. 10,000 Square Feet, Stacked Court is little-used - neither for memorial activities nor for other activities. Hourly avg. 32 people in Memorial Ct.
West Side of Van Ness + Memorial Court Key Takeaways •	Area used most regularly by bus riders •	Seating insufficient for peak demand •	Memorial Court is little-used Design Challenge •	Enhance transit stops by providing transit- and city-provided seating incorporated into a high-quality public realm - leverage Van Ness Bus Rapid Transit •	Test new uses in Memorial Court by adding seating and programming. City Hall Key Takeaways •	The steps of City Hall and the grassy area that surrounds them are surprisingly well-used. Despite not being designed for active use, they are one the most powerful generators of life and activity in the District. Design Challenge •	Connect the activity on City Hall steps to Civic Center Plaza, which could benefit from life and activity. •	Cultivate similar energy on the west steps. Although it is designed as a public space, 1p 2p 3p 4p 5p 6p Civic Center Plaza has no more public lifeActivities density per square foot than the area City Hall Average Hourly Per 10,000 Square Feet, Stacked around City Hall (designed to be decorative), or around Memorial Court and Van Ness (used mostly as a through-way). This may be12pbecause at 2p key times in4pthe morning 10a 11a 1p 3p 5p 6p and evening activities like sleeping and City Hall Average encampments Hourly Activities Per 10,000 Square Feet, Stackedthe public life dominate profile and discourage others from using it. The lack of spatial definition of Civic Center makes 1pits public life Because 10a 11a 12p 2p 3p fragile. 4p 5p 6pit is so wide open, one person or group can vic Center Plaza Average Hourly Activities Per 10,000 Square Feet, Stacked overwhelm and break the integrity of the entire space, compromising the experiences of everyone else. Civic Center Plaza Key Takeaways •	Density of people spending time in Civic Center Plaza is very low. •	Active edges and spatial definition are important life generators and without them, Civic Center Plaza suffers. Design Challenge •	G  enerate the type of life and activity that occurs at the edges of the buildings that surround Civic Center Plaza by introducing new “edges”, human scale design features, and daily programming and activities. A spot-survey of Civic Center while the playgrounds were open was conducted in February 2017 prior to construction. Civic Center Playgrounds Key Takeaways •	The survey did not reveal a higher volume of public life in the plaza on average when the playgrounds were installed. •	Although play was a component of the public life when the playgrounds were installed, most of the people spending time in the plaza were adult men and activities like drug use comprised as much as 7% of all activities. Design Challenge •	Ensure proper stewardship to allow safe access for children, the intended users of the playground. Fulton Street and the plazas in front of the Library and Asian Art Museum had some of the highest density of 10a 11a 12p 1p 2p per3psquare 4p foot in 5p 6p staying activities the Civic Center District, especially ial Court Average Hourly Activities Per Per 10,000 Square Feet,Feet, Stacked City Hall Average Hourly Activities 10,000 Square Stacked when accounting for the fact that they were either activated by modest programming, or not formally activated at all.1pThe presence of the only5pthree 6p a 11a 12p 2p 3p 4p ple per 10,000SF public benches as well as humanple in Memorial Ct. Center Plaza Average Hourly Activitiesplazas, Per 10,000 Square Feet, Stacked and shade scaled seatwalls, reinforce the fact that people spend time in areas that honor the human scale. Hourly avg. 3.7 people per 10,000SF Hourly avg. 45 people in Fulton St. The number of people engaged in er Plaza Average Hourly Activities Per 10,000 Square Feet, Stacked “other activities” is high, but their presence is overwhelmed by the life of the market. The rest of the Civic Center Commons could learn from this of “diluting” impact5pof illegal 11a 12pinstance 1p 2p 3p the 4p 6p activities with robust programming. UN Plaza (Market Day) Key Takeaways •	UN plaza bursts with activity on Market days - but limited seating with no shade limits the number of people staying to eat lunch. •	Number of activities like drug use and encampments remains high, yet it does not dominate because of the number of other people in the space. Design Challenge •	Fulfill latent demand for seating by adding a variety of highquality, flexible invitations to sit and stay during market days. Even on non-market days more people 0a 11a 12p 2p 3p in UN 4p Plaza 5p 6p choose1pto spend time than in the other public spaces of City Hall Average Hourly Activities Per 10,000 Square Feet, Stacked Civic Center Commons. Yet, it is still much less active than comparable public spaces outside the District. Activities and are 12p 1plike eating 2p 3p drinking 4p 5p as high on non-market days as on City Hall Average Hourly Activities Per 10,000 Square Feet, Stacked market days, suggesting that there is even more demand for seating at lunch on market days and demand 11a 12p 1p amenities 2p 3p 4p 5p for these on a daily basis. The number of people engaged in “other activities” is equal to market days, but because of lower total volumes of people in the space, there are times throughout the day3pwhen activities like6pdrug use and6p 1p 4p 2p12p 4p2p 5p3p 7p5p encampments dominate the space. UN Plaza (Non-Market Day) Key Takeaways •	UN plaza remains active on non-market days. •	The amount of sleeping, encampments, and drug use remains high on non-market days and is more visible because of the lower volume of people on these days. Design Challenge •	Build on existing demand for market activities by expanding the daily availability of amenities in the space and providing opportunities to sit and stay. •	Build on success of market by adding daily commercial activity. •	Create space for culture and commerce on blank facade at back of Orpheum Theater. The number of people sleeping, encamped, doing drugs, intoxicated in public, panhandling or exhibiting aggressive behavior doubled at night. Our city’s central common space should feel welcoming to people from all walks of life - from tourists to patrons of the arts, to people experiencing homelessness and those living in SROs. Some activities measured here, such as public sleeping, are not necessarily negative unto themselves. Others, like public drug use, are illegal and clearly have a negative impact on other potential users of the space. The undefined, wide-open nature of Civic Center’s public spaces, combined with the associations that many people have with homelessness and drug use, means that some activities like encampments, have unintended consequences of deterring other people from spending time in the space. How might Civic Center productively discourage illegal activities while also providing more reasons to be there? Design Challenge •	Create more invitations for more people to come more often and stay longer •	Support and enhance district stewardship activities like the Downtown Streets Team and Hunters Point Family •	Pursue thoughtful design to create more activity that discourages illegal uses. What best describes your relationship to Civic Center? Different users of Civic Center Attendee (cultural event or institution) experience the same spaces differently and want different things from the space. In some cases, we found Student (of nearby school) statistically significant differences in the way people perceived the Other public spaces of Civic Center. The following pages highlight findings by user group from the intercept survey which had 419 responses. A. What things would you like to do in the public spaces of Civic Center that you can’t do now? B. What would make you feel more safe in this place? Neighbors, including unhoused people, tended to want more recreational activities. They mentioned the words clean and ‘homeless’ but not as much in association with ‘drugs’ or ‘unsafe’. Neighbors of Civic Center tended to rate the space more positively. 1/4 recognized a person they did not plan to meet. lots more reasons to visit! By day, resplendent; by night, unnerving; architecturally stimulating. Design Challenge •	More photo-ops and other activities (including food and drink) that invites tourists to stay longer at different times of the day. Woman Women have a more negative perception of Civic Center compared to men. Although 50% of the people moving through Civic Center are women, few of them stop and stay. This may be because women tend to be sensitive to issues of safety in public and are deterred from spending time in Civic Center’s public spaces because of the ratio of undesirable activities to desirable activities. Design Challenge •	Women are invited to spend time in Civic Center’s public spaces. creating opportunities for eating and drinking in the District. •	Enhance the experience of walking to and from transit and parking garages by improving pedestrian lighting and adding daily programming and activities. Special- event-goer Cultural institutions in Civic Center draw thousands of patrons every year. But, these events have a modest impact on Civic Center’s public life. Theatre-goers dash to their cars or transportation to go home after shows. On average, there are 41 weddings every day at Civic Center, yet time for a ceremony and photographs in the Rotunda is limited. The steps are crowded as couples take photos there, but few extend their experience to Civic Center Plaza. Potential User Most of the potential users of Civic Center are already in the district - they just need targeted invitations spend more time. Low income people making between $10-25k were under-represented in the intercept survey, as were Asian-Americans and students. How can the design and programming of Civic Center extend genuine invitations to these user groups? This section of the document proposes a series of principles and strategies from amplifying and improving public life in the Civic Center District. Civic Center is for everybody. It exemplifies San Francisco’s ideals of tolerance, generosity, and diversity •	Civic Center welcomes diverse people - People move to San Francisco from around the world to experience diversity and tolerance, and Civic Center celebrates these values at their best. •	Civic Center fosters coexistence between diverse people and cultures face-to-face - Programming that appeals to different cultures and income groups is held at the same time, in the same space. •	Genuine invitations are present for all users of the space, regardless of background or income. The design makes “just being here” a dignified experience. A genuine invitation can be as simple as a dignified bench or a coffee shop, or as complex as a march or wedding. 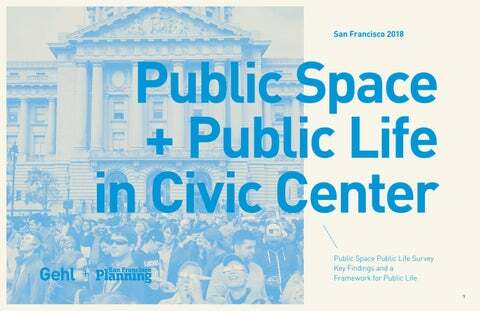 •	The public life of Civic Center is resilient - The space limits the invitations for illegal activity like drug use and drug dealing, and limits the negative impacts of activities like personal encampments without banishing them. Civic Center is generous at the human scale and supports everyday public life •	Basic amenities - Seating, shade, human-scale lighting, bathrooms, drinking fountains, and wayfinding are sufficient for this large public space. •	The urban quality of the space provides safety, comfort, and enjoyment and supports everyday moments of rest - Civic Center invites people to have lunch in the fresh air, meet with fellow students, relax in the evening, and spend time with family and friends on the weekend. Great public spaces are also a good place to spend an hour - a place to be between A + B. •	Play and recreation are supported in Civic Center - Playgrounds and facilities for recreation complement the neighborhood public realm network. Civic Center’s public realm encourages democratic participation by providing space for large civic gatherings as well as smaller acts of civic life •	Major moments to debate and reaffirm our civic values continue to have a home in San Francisco’s Civic Center. •	Daily civic acts central to our democracy take place in Civic Center’s public spaces as appropriate, certain civic activities such as graduations, volunteering, and elements of the voting process should be invited to occur in the public realm around Civic Center. The Civic Center district has a strong identity, expressed and anchored by a connected public realm. •	Physically connected - It is easy to walk and cycle through the district and connect to adjacent neighborhoods with clear gateways. •	Programmatically and culturally unified Coordinated programming, public art, operating hours, wayfinding, and branding. •	Stewardship and enforcement - Law enforcement, ambassadors, cleaning, and other stewardship operates as one or in close coordination with one another. M ar ke tS t.
These walkable streets should be safe, consistent, convenient, and delightful with world-class sidewalks, intersections and gateways. The pedestrian network moving to and through Civic Center should exemplify the best of the city and highlight the city’s commitment to people-first mobility. Consistent and high quality pedestrian connections Civic Centerâ&#x20AC;&#x2122;s feeder streets should be of high quality and notify people they are in the district through consistent furnishings and district branding. The bicycle network moving to and through Civic Center should exemplify the best of the city Grove and Polk Streets have been identified as priorities for the city’s cyling plan. Highlight the city’s commitment to advancing people-powered, non-motorized transportation by making these showcase facilities that are consistent, connected, and convenient. A special focus on gateway intersections approaching Civic Center’s key public spaces A gateway can be a welcome mat or a barrier to people entering into the Civic Center district. Emphasize these key hinges with high quality crossings, short crossing distances, short crossing times, and improved crosswalks that ease movement to and through the district. Create inviting gateways by incentivizing active street edges along key streets like Larkin Street. The grand Beaux-Arts axis is the defining feature of Civic Center - let the public realm mirror the architectural significance of this big move by creating a new enhanced civic and ceremonial axes from the steps of City Hall to Market Street. Create a civic mall The Civic Center ceremonial axis is modeled after other major ceremonial axis and was once a bold connection from the City Hall Steps to Market street. Create a bold axis and corridor for major civic events that aligns the visual axis with strong pedestrian connection and mass gathering space. New mid-block crossings Respond to existing pedestrian desire lines and create new mid-block crossings. Create a sense of enclosure and entry into the ‘quiet axis’ of Memorial Court through a soft threshold, like a grove of trees. Enhance central Beaux-Arts City Hall / Market Street axis by placing a focal point at the east terminus in UN Plaza. Focal point should be a center of activity that relates to the commercial character of this space. Focal points act as magnets in a space, and draw people to them. They enhance existing views, add interest and provide an important sense of orientation for users of the space. Focal points can be low to preserve views. Establish a new focal point in Civic Center Plaza between the iconic architecture of Supreme Court and Bill Graham Auditorium. Introduce a new focal point monument, public art piece, pavilion, or other feature at the center of this new, reinforced axis. New focal points Spaces around the world that share Civic Center’s Beaux-Arts style have found a way to delight all five senses at the human scale - from mobile book libraries, climbable statues, to splashparks. The quality of space in Civic Center is highly influenced by the quality of the building edges that surround it. Add new entrances where possible and activate edges and entrances to promote and support healthy public life. Amplify existing entrances Seating, seatwalls, planting, shade, transparency and human-scale elements at the entrance of a building make it a more active edge. Re-orient entries of the Asian Art Museum and Library towards Fulton Plaza. Add new entrances UN Plaza and Van Ness can be activated by adding new entrances to existing Beaux-Arts facades. In Europe for example, it is common to find a beer hall or restaurant in the cellar of the town hall, even in areas with traditional architecture. UN Plaza at Hyde St. Spaces with active edges promote robust public life. By introducing human-scale rooms and complete street corridors, more people will feel invited to stay. Spatial organization creates a framework for life to unfold, and should be designed to support the desired public life profile of Civic Center. A new, built edge to complete the street wall Pavilion-type structures could provide spatial definition to Civic Center Plaza and create new nodes of activity and opportunities for programming and activation during the day and at night. Consider introducing new built, edges along McAllister Street and Grove Street to complete the street wall with an active edge. A socially resilient space through design As we discovered in our Public Life study, activities like drug use and encampments have ripple effects in a space - deterring people from spending time there. When designed with care at the humanscale, spaces that act like outdoor ‘rooms’ can create conditions for disadvantaged and non-disadvantaged people to coexist side-by-side. The social effect of landscape ‘rooms’ are highlighted in the example at right by a public life study from spaces in Copenhagen, DK. In this space, people drinking and using drugs (red) spend time within a circular barrier or to the east of it, while others (blue) spend time outside of the barrier, and in the western edge of the space, effectively sharing the space. Two cafes with different clientèles, one low-income and the other moderate income, exist side by side. A socially resilient space through program Many successful civic and neighborhood spaces contain a wide spectrum of public life. One user group should never dominate use of a large public space like Civic Center - whether they are dog walkers, wedding guests, or people experiencing homelessness. Through unique, active invitations to be in the space, people who are engaged in less socially acceptable behaviors can continue to be there, alongside people there for other reasons. Civic Center should have a coordinated strategy for district stewardship. This could take the form of an interdepartmental working group, a “friends of” group, and/or a single maintenance or management entity. Stewardship, district identity, ambassador programs, programming, and other positive elements of stewardship should be coordinated with enforcement, police, cleaning, and other necessary activities. District-wide coordinated stewardship and safety Stewardship and safety organizations should coordinate within the Civic Center district to to work towards common goals, including creating a safe environment for all that limits the impact of illegal activities. Programs for social mixing Civic Center should offer a wide variety of activities that appeal to a diversity of people so everyone feels welcome. Public events should be planned such that different types of people interact in Civic Center. For example, a paid event should occur alongside a free one. A pop-up care village should occur alongside free games and music. Civic Center should use its unique large scale to meet neighborhood public space needs that are unmet by the area public space network. The spaces should meet the needs of more vulnerable neighborhood residents such as seniors, teens, and kids. 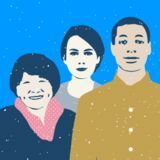 Encourage small acts of democracy Look for ways to encourage smaller acts of democracy such as voting, immigration ceremonies, graduations, or specific-issue demonstrations. Reduce barriers to small-scale user-generated programming Small-scale events, artwork and commercial activity can provide a more consistent and neighborhoodscaled activation of the public spaces of Civic Center. The current permitting process favors large events, as reflected in the use patterns of the Commons. To encourage daily and neighborhood-scale use, permitting for small-scale programming should be streamlined, providing fewer barriers to entry than large events. Civic Center’s public spaces should provide genuine invitations to stay. Unique program areas can create moments that are just as special, symbolic, and iconic as the district’s architecture. Spaces can be brought to life by giving them distinct and visible programmatic identity. Program areas and description at right. Design precedents for each major space in the pages to follow. UN Plaza More flexible seating with shade and enclosure during markets Commerce in UN plaza every day of the week, not only Farmerâ&#x20AC;&#x2122;s Market Integrate BART into the public realm while improving a sense of safety by positioning a late-hours vendor like a flower kiosk or a newspaper stand near the BART entrance. Encourage 24/7 commerce Civic Center needs a diverse ecology of commerce its major public spaces. Consider encouraging a flower stand or news kiosk to open directly adjacent to the BART portal in UN Plaza to create passive eyes on the street and make BART riders and people departing from Civic Center entertainment feel more safe. Consider coinciding a night market on evenings when the theaters are active. In addition to brick-and-mortar activation, UN Plaza should have regular ephemeral events such as the Farmerâ&#x20AC;&#x2122;s Market as well as smaller ephemeral programs like street vending. These active uses, when commercial, should not overshadow the civic nature of the space. Celebrate transit stops 25% of users of this space use public transportation to get here. Dignify their journey by making transit connections part of the public realm experience. Emphasize BART plazas as part of the public realm; Celebrate transit stops in front of Asian Art Museum + Library, and along McAllister and Van Ness. A green plaza Fulton Street can be a new neighborhood green space, framed by the Library and Asian Art Museum, with events and activities at the edges which spill out into the space. Celebrate Views Design of the Civic Center Plaza should reinforce the Beaux Arts symmetry and celebrate its grand architecture. Views should be emphasized along secondary axes (e.g. between Bill Graham Civic Auditorium and the Courthouse, and between the Library and the Asian Art Museum), as well as the primary grand axis from City Hall to Market Street. Pavilions + Kiosks Consider a series of small or large pavilions or kiosks to bring life and activity to Civic Center Plaza. Install basic public space amenities Install basic public space amenities such as trash cans, water fountains, bathrooms and human-scale lighting to create a safe and pleasant walk at all times of the day. Wayfinding that highlights common routes and the civic center axis and encourages people to explore the district. Basic public amenities should be visible and accessible from key entry points to Civic Center. Dramatically increase opportunities to sit, lean and stay Civic Center should have many more invitations to sit, lean, and stay. Healthy public spaces invite approximately 50% of all people spending time in a space to sit. In the past, too modest increases in the amount and variety of opportunities to sit and stay in Civic Center have communicated to the public that seating is a rare commodity, and private “encampments” in the few seats available have compounded on this perception. With proper stewardship to guard against the “privatization” of public seating, Civic Center can provide opportunities for everyone to stay. Take advantage of microclimate In San Franciscoâ&#x20AC;&#x2122;s notoriously foggy, windy, and chilly climate, Civic Center has corners that are in sun for most of the day year-round, especially the northeast corner of Civic Center Plaza. However, anyone walking out of City Hall in the afternoon will be in shadow. Creating comfortable places to sit down relax that take advantage of the positive microclimate in Civic Center Plaza will enhance enjoyment of this space. Delight the senses The visual delight in Civic Center’s Beaux Arts architecture should be matched by delight to the senses of touch, sound, smell, and taste. Water features, aromatic gardens, and other sensoriallyrich features offer intrigue and connect people to the landscape. Opportunities to connect to San Francisco’s history through the senses, like a Dahlia garden, should be explored. Recreational uses in Civic Center District supports gaps in the neighborhood public realm network Civic Center sits at the center of several neighborhoods, each of which have their own network of public spaces. Civic Center Plaza should support but not duplicate the existing public realm network. Recreational uses should not overshadow the civic nature of the space. How can Civic Center pick up the slack where neighborhood open space networks are lacking to better serve people in these neighborhoods? We recommend a comprehensive assessment of existing recreational amenities. Programming in the “Front Porch” of cultural institutions Use the public spaces adjacent to cultural institutions to bring cultural programming into the public realm. Bringing life to these dead zones is a key priority for the public realm plan. Even on a market day, when UN Plaza is bustling with activity, the rest of the Civic Center Commons are pocked with ‘dead zones’ where there is little to no staying activity throughout the day. Design of Civic Centerâ&#x20AC;&#x2122;s public realm should prioritize the type of life that we want to create in its public spaces; spacial and programmatic organization supports the desired public life profile and invites a density of activities.